Earlier today, Apple released iOS 6.1 beta 1 to developers. Only registered members of iOS Dev Center currently have access to it. 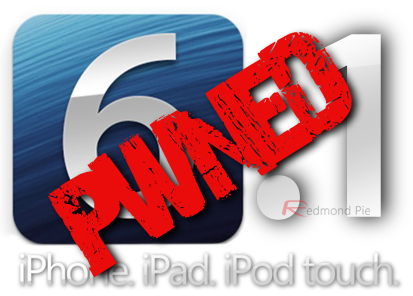 If you are a iOS developer who develops tweaks and apps for Cydia, you might be interested in a jailbreak for iOS 6.1. As it turns out, just like iOS 6.0.1 which was released to public today, iOS 6.1 beta 1 can be jailbroken too using the current latest version of Redsn0w. We have tested and can confirm that the same method that was used to jailbreak iOS 6.0.1 can be used to jailbreak iOS 6.1 beta too. But just like any other early jailbreaks, this one too is limited to tethered boot for now, and is compatible with pre-A5 limera1nable devices like the iPhone 4, iPhone 3GS and iPod touch 4th-generation. All the newer devices like the iPad mini, iPad 4, iPad 3, iPad 2, iPhone 5, iPhone 4S, and iPod touch 5th-generation are out of luck for now. Dev-teams involved in jailbreaking are working hard on an untethered jailbreak for all devices, but currently there is no update on when will they get close to actually releasing a public jailbreak. In the meantime, you can follow our simple guide below to jailbreak iOS 6.1 beta 1 tethered on the above mentioned supported devices. 1. Download iOS 6 from here. Download iOS 6.1 beta 1 from iOS Dev Center. Update your device to iOS 6.1 beta 1. 2. Download and run Redsn0w 0.9.15b3 (Windows/Mac). 3. Navigate to Extras –> Select IPSW option and manually point Redsn0w to the original iOS 6 (not iOS 6.1 beta 1) file. 4. Now from the main screen of Redsn0w, simply click on Jailbreak, followed by Next to select Cydia. Enter your device into DFU mode with the help of onscreen instructions on Redsn0w. That’s about it. Redsn0w will now automatically inject your device with Limera1n exploit to jailbreak and install Cydia on it. Once done, select “Autoboot this device when it connects in DFU mode” to restart the device in tethered boot mode. Since this is a tethered jailbreak for iOS 6.1, you will always need to reboot your device into tethered mode in order to run Cydia and other jailbreak related apps. Whenever your device loses power, simply connect your device to your PC or Mac and start Redsn0w. Navigate to Extras and then just use Just Boot option to boot into tethered jailbreak mode.